"Ron Baker is the most prolific and best writer when it comes to pricing services. This is a must-read for executives and partners in small to large firms. Ron provides the basics, the advanced ideas, the workbooks, the case studieseverything. This is a must-have and a terrific book." "We've known through Ron Baker's earlier books that he's not just an extraordinary thinker and truly brilliant writerhe's a mover and a shaker on a mission. This is the End of Time! Brilliant." "Implementing Value Pricing is a powerful blend of theory, strategy, and tactics. Ron Baker's most recent offering is ambitious in scope, exploring topics that include economic theory, customer orientation, value identification, service positioning, and pricing strategy. He weaves all of them together seamlessly, and includes numerous examples to illustrate his primary points. I have applied the knowledge I've gained from his body of work, and the benefits to meand to my customershave been immediate, significant, and ongoing." "Ron Baker is a revolutionary. He is on a radical crusade to align the interests of service providers with those of their customers by having lawyers, accountants, and consultants charge based on the value they provide, rather than the effort it takes. Implementing Value Pricing is a manifesto that establishes a clear case for the revolution. It provides detailed guidance that includes not only strategies and tactics, but key predictive indicators for success. 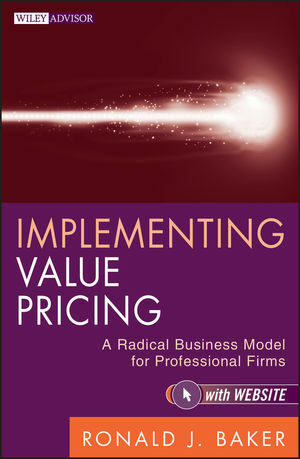 It is richly illustrated by the successes of firms that have embraced value-based pricing to make their services not only more cost-effective for their customers, but more profitable as well. The hallmark of a manifesto is an unyielding sense of purpose and a call to action. Let the revolution begin." RONALD J. BAKER is the author of Professional's Guide to Value Pricing, Sixth Edition, The Firm of the Future, Pricing on Purpose, Measure What Matters to Customers, and Mind Over Matter. He is founder of VeraSage Institute, the leading think tank dedicated to teaching value pricing to professionals around the world.